The demonstration today in London was, according to concerned, the largest ever held in London on Palestine. This is even more impressive if one remembers that similar demonstrations were held today in many other cities in the UK. This is evidence to the depth of feeling, anger and disgust, not only with Israel and the USA, but more importantly, with the UK government and its immoral and despicable behaviour, the same position it took during the Summer 2006 and the destruction of Lebanon. This demonstration, and all the speeches in it, are sending a loud and clear message to the UK government, to USA, Egypt, but first and foremost, to Israel: “Your war crimes will not be forgotten, will not be forgiven, will not go unpunished”. Many of the speakers on the platform, from all political persuasions, have called not just for the end to the invasion and bombing, the removal of the illegal blockade, but for the end of the occupation, the removal of the Apartheid Wall, and for a Just Peace in Palestine. 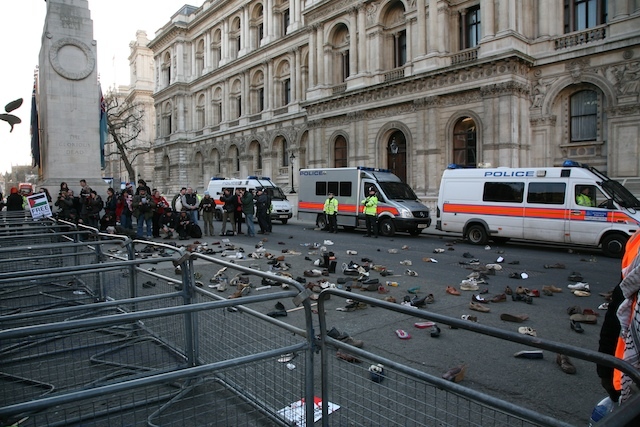 While passing in front of the heavily protected Downing Street entrance, thousands of shoes where hurled by the demonstrators at the police, and towards Number 10. This simple, symbolic retort of the powerless, so powerfully used og George Dubya Bush in Iraq, will remind the British government what their citizens think of their behaviour. You can see it in the pictures below. From Trafalgar Square thousands marched to the Israeli embassy. The good behaviour of the Met was all gone there, as it normally does, and in the violence which ensued, many protesters have been injured, and many arrested. Full marks go to the Metropolitan Police for not allowing free speech in the capital, and for protecting the embassy of the mass murderers so well. We are not expecting Israel to take any of those demands into account, obviously. What we are expecting, though, is our own governments, who have financed the PA construction of a modern infrastructure in Gaza, now all in ruins, and who continue to trade with Israel, including selling it arms, to act immediately to end this murder. The speakers have, one after another, reminded the thousands in the square that those who do nothing when war crimes are committed, are just as culpable as the criminals themselves. Below you can see a selection of images from this amazing demonstration. By clicking on pictures you can see an enlarged image. End the occupation! Out with the settlements and the apartheid wall! End Zionism Now!